The hip-hop improvisers Abandoman lay down the beats and explain why they’re one of the most exciting comedy acts on the circuit. 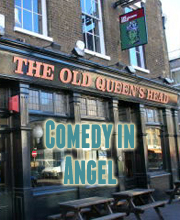 Including a wonderful new improvised intro for Laugh Out London! Sketch duo Dregs, comprising stand-ups Max Dickins and Mark Smith also join us on another Test Tube comedy night – this time at the Canal Cafe in Paddington-ish.